Today I have for you such a delicious tender, flavorful chicken recipe that is now probably one of my all time favorite chicken recipes ever. When I cooked the chicken I could not believe how tender it was. When I sliced into it, to check if it was fully cooked, it cut so easily I thought for sure it was still pink in the middle, but it wasn’t. I was like what? I took it off the grill and I kid you not, my fork could pretty much cut the chicken. Talk about tender. How did this chicken become so tender? It was because I marinated it for 8 hours. 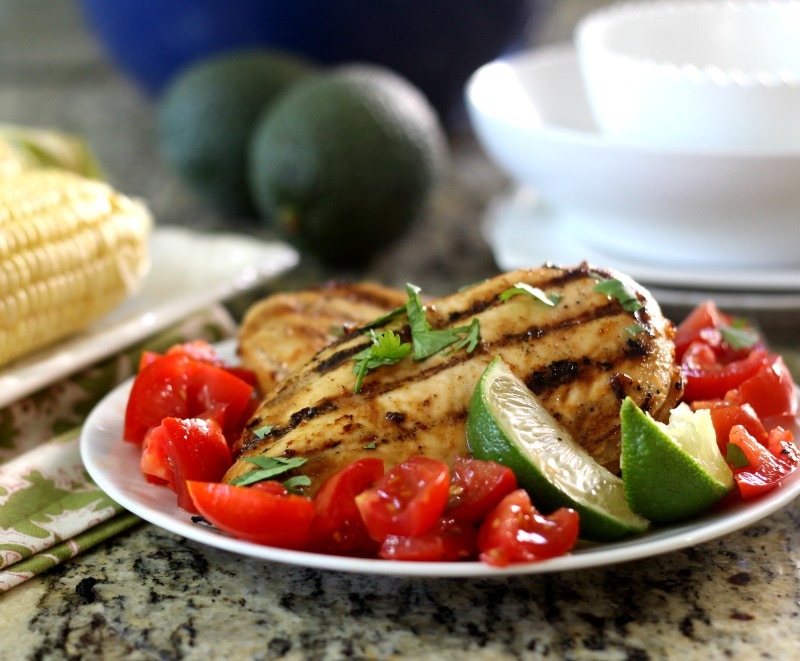 I’ll get into that more in a second, but here is today’s recipe; Chipotle Tequila Lime Chicken. 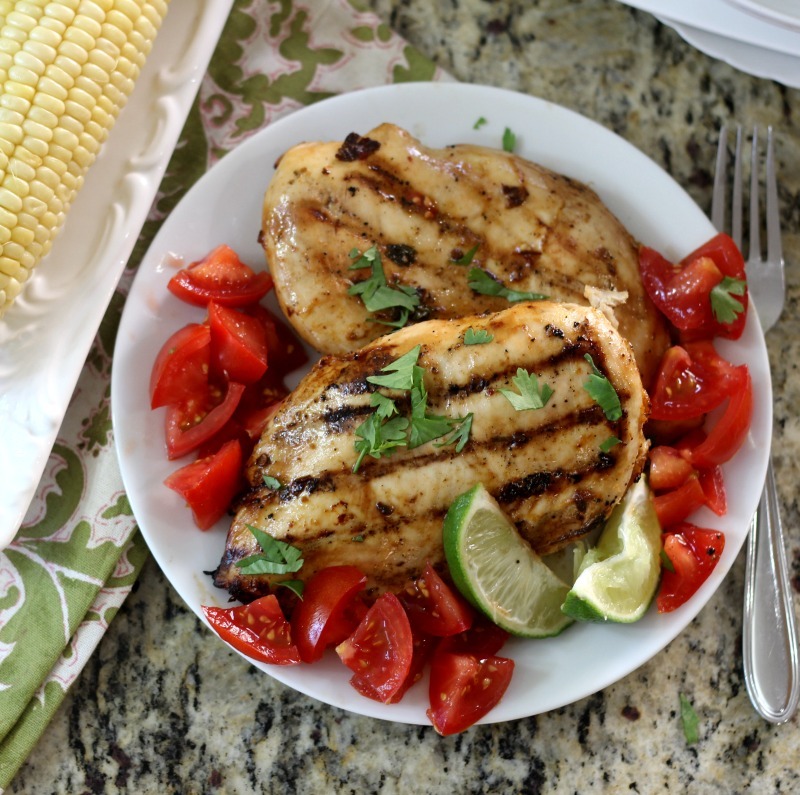 When you take a bite of the chicken you get a hint of lime, a little kick of smokey spice and just a little bit of tequila flavoring. It has all the flavors of a Mexican fiesta. It is great served with an ear of corn or side salad or sliced up and placed in tacos. You can’t go wrong with this chicken. It’s perfect for grilling season. Plus it’s quick to make too, which is a bonus. But the key is to marinade it for a few hours or 8 hours like me. I kind of winged the marinade together in less than 5 minutes. I made it just before going to work. I took a Pyrex measuring cup and added juice from limes, lime zest, chipotle peppers in adobo sauce, garlic, tequila, cilantro, olive oil and salt & pepper. I mixed it well and poured it over my chicken and sealed it in a Ziplock Baggie. To really bring the flavors together, you could mix this in a food processor, but I didn’t have time for that. I try to go quick and easy when it comes to cooking, especially at 5am when I made this. I cooked the chicken oh for about 7 minutes per side on the grill and just before serving I squirted lime juice over the top and sprinkled some cilantro. I also served it with some diced tomatoes to give a fresh flavor. I did the most horrible thing, I tried to cut a not unripe avocado to go with it. That did not work. I don’t know what I was thinking? So take it from me, wait for your avocado to ripen other wise it is as hard as a rock. You need patience waiting for these things to ripen, which apparently I didn’t have that day. 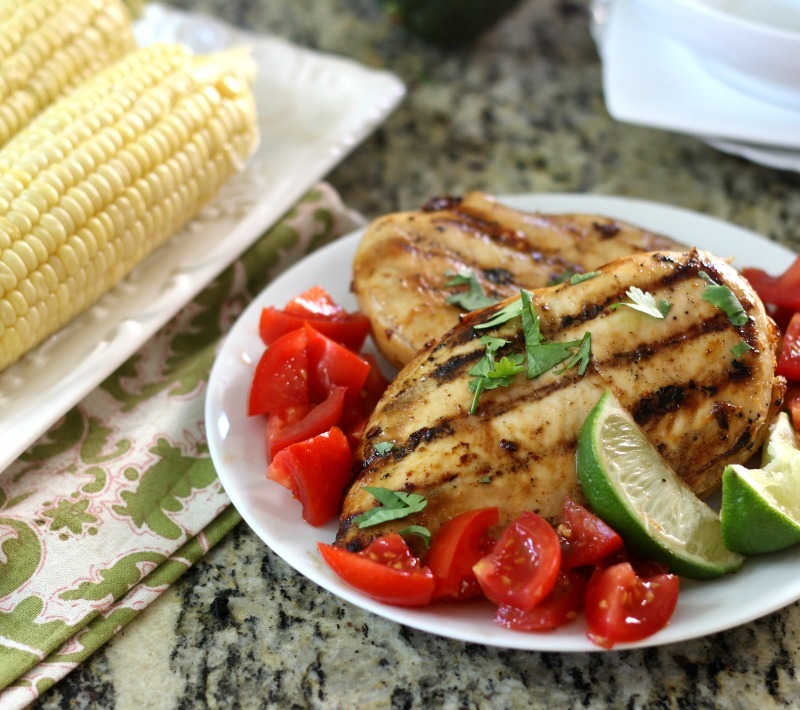 Tender, juicy grilled chicken with Mexican flair that has a slight smokey, spicy, citrus flavor. In a bowl, add all of the ingredients except for the chicken; mix until well combined. You could also add these ingredients in a food processor to combine more easily. Place chicken in a Ziploc Baggie and add marinade. Mix the chicken in the marinade until it is all covered. Place in the refrigerator for 4 to 8 hours or overnight. I marinated for 8 hours. Heat grill to medium; take chicken out of the baggie and dispose of the marinade. 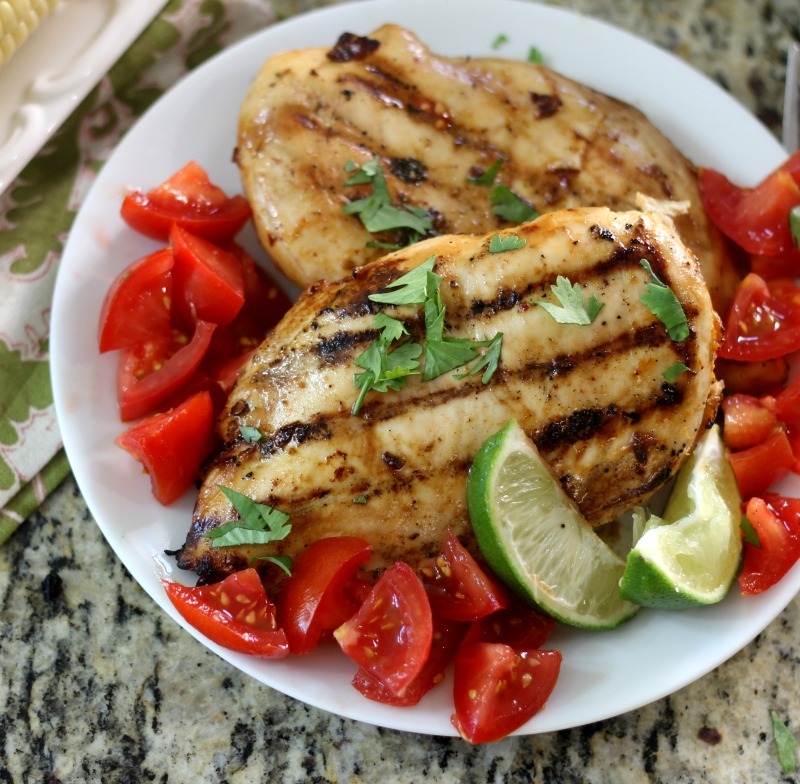 Place chicken on grill and cook each side for about 7 minutes; depending how thick your chicken is. Cook until no longer pink. 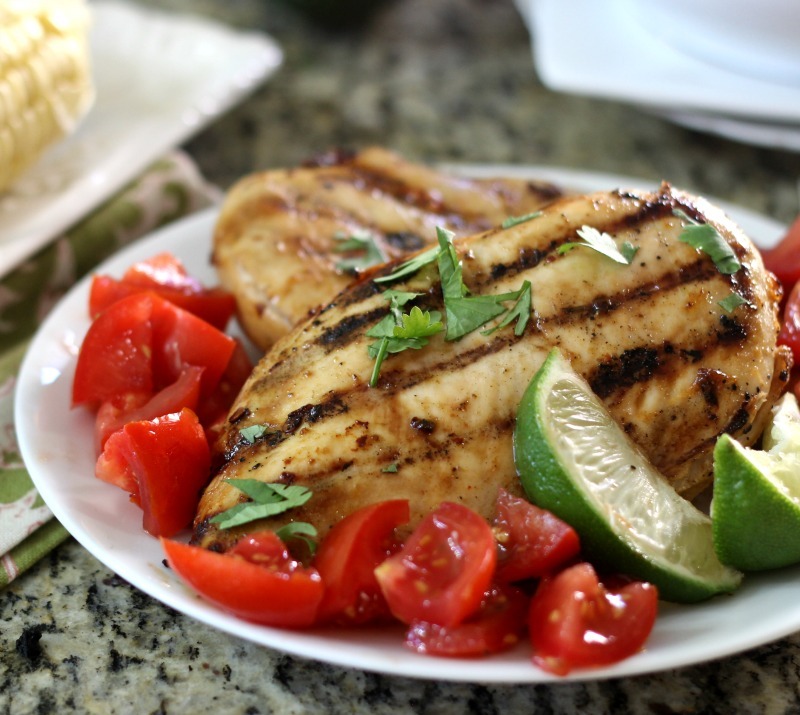 Place chicken on a serving platter and squirt lime juice over the top. I am so happy Summer is almost here. I love grilling season!